Exciting news from Cambodia. Shortly after Wes Autrey and Wayne Burger departed we had two baptisms. Just a few days ago we baptized four more souls into Christ. They are all from Banteay Meanchey Province. This is the hometown of one of our students. The new Christians all studied with our student and Chann (our local preacher in Siem Reap). 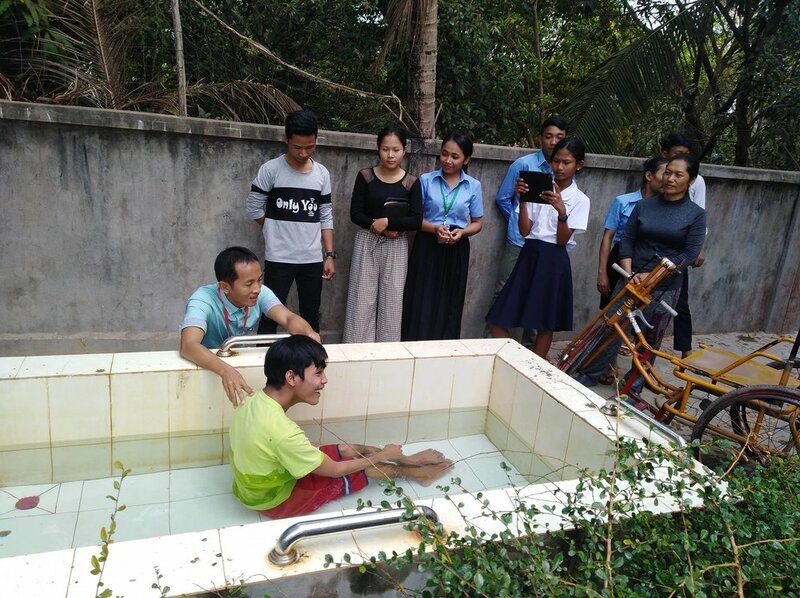 All four decided to get baptized and drove 100km to be immersed into Christ in Siem Reap! Their names are Pheng (boy), Seoung, Seaiv, Monica (girls). This is a beautiful thing. Praise to our Lord Jesus Christ. Please keep them in your prayers. We are doing good here and are close to the Khmere New Year, so the students are heading to their home towns for the holiday. Our second trimester will officially end on May 3. We have four courses in one trimester. Currently we have been studying about Christian Evidence 2, and Fundamentals of the church 1. We did have two students recently drop out and we ask for prayers on their behalf so that they will return to a life of following God. We pray that God will open their hearts in order to let them back to study His word. During this month the students attended a seminar in Phnom Pehn at the Best Center. The main topic was about the Present Decision for the Future Result (How to choose the Right Partner) and it was taught by our very own director Darat Run. 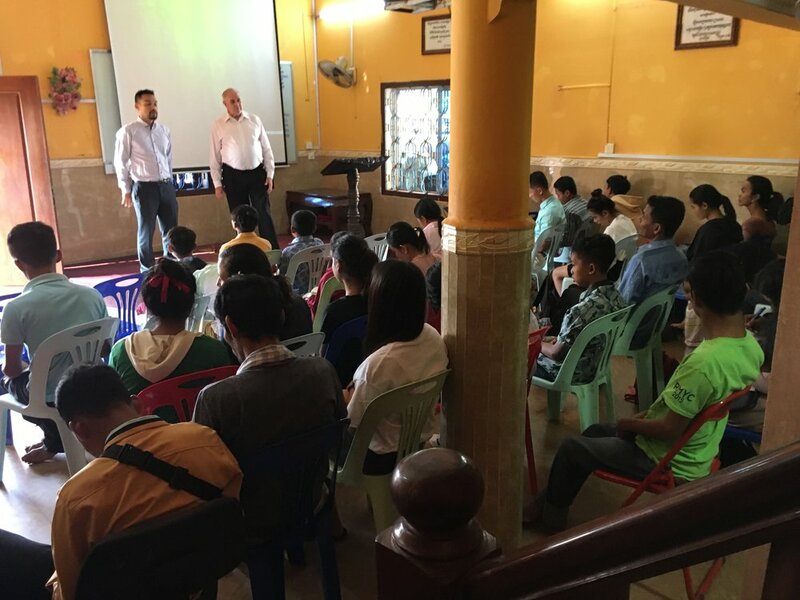 We also had another seminar in the city of Battambang on Leadership where our brother Phanat is working with more bible students and starting a new congregation. It was very uplifting to everyone and we learned some good ideas and concepts. We are expecting Wes and another group to come visit us in June to teach and begin a girls camp for spiritual maturity in girls. We look forward to that very much. (See Wes’ Report Notes below). We thank everyone involved with the work in Cambodia as we strive to do God’s will. I returned home from a recent stay in Cambodia of about 3 weeks. I traveled with Wayne Burger, who is a preacher, teacher, evangelist, and everything good in between kind of servant for God, Wayne taught for a week on Hermeneutics. The new students, staff, members of the church, and a group from Battambang City learned a great deal from Waynes wisdom and teaching skills. I stayed a week longer after Wayne returned home and taught a morning class on How We Got The Bible and afternoon class on English. It is a joy to teach eager minds that want to learn. My next trip will be in June, and I am happy to be traveling with my wife, daughter and mom along with Tyler King. Tyler is a recent Bear Valley Bible Institute graduate and current BV staff member. He will be teaching class to the men and also be training them how to weld in the evenings. Tyler is a multi-talented young man who will inspire the students in Cambodia. Attached are a few photos that speak more than my words. I hope they inspire you to live faithfully until He comes again - so that we may all be His family in Heaven. God bless all of you and your love for the kingdom of God. Posted on April 11, 2019 by Wes Autrey and tagged cambodia.